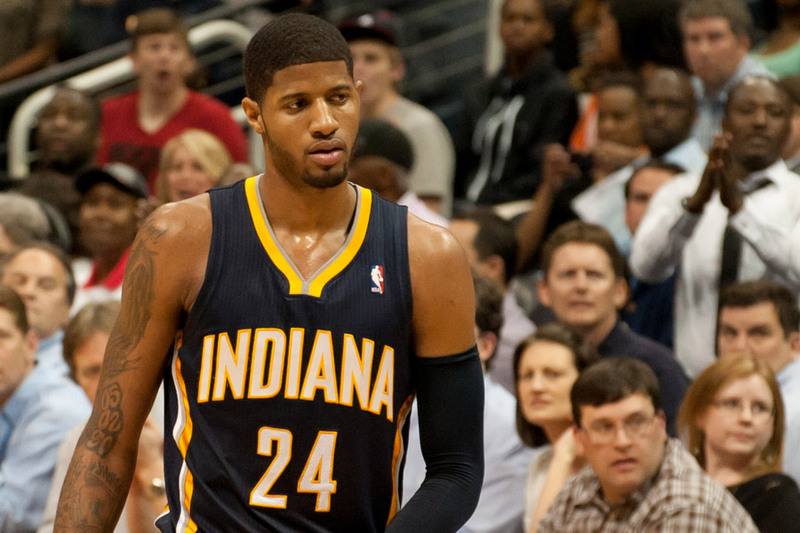 It seems like Paul George takes that “next step” every season. He was the NBA’s Most Improved Player last season, but like Kevin Love in 2011 and 2012, there’s always curiosity about him winning it a second-straight time. Arguably this season’s most obvious improvement in George’s game has been his comfort handling the ball while attacking just about every area of the court. That’s huge when he’s taken on a bigger load of the offense. He’s upped his usage rate from 23.5 percent in 2013 to 28.1, but trimmed his rate of turnovers from 15.2 percent to 11.8. He’s also been scoring more efficiently with an increase in his true shooting percentage, effective field goal percentage, and free throw rate. In particular, measuring his usage and true shooting puts him in company with only nine other players this season. Here are the top 10 shooters. I only included usage rate because I needed another category to help fix formatting issues, but that statistic will come in handy later. Over the years, other elite wings have been up and down with how many corner threes they’ve taken. That isn’t surprising when expanding players like George to that area takes away the impact of role players who specialize in shooting corner threes. (You could also say this about LaMarcus Aldridge, who has Wes Matthews and Nicolas Batum taking plenty of shots from the corners, and Dirk Nowitzki throughout his career.) Kevin Durant doesn’t take many shots from the corners at all while Kobe Bryant and Carmelo Anthony have been hot and cold throughout their careers. George is an exception along with LeBron James, who developed a killer right corner three last season. For George, he’s averaged about one corner three attempt per game since 2012, and though he tends to favor the right corner he’s been equally good (or in 2012, bad) from either side. He’s currently 13-for-24 from the left corner three and 19-for-30 from the right side with most makes coming from spotting up in transition, being the beneficiary of drive-and-kicks, and capitalizing on meltdowns from opponents while defending Indiana’s inbound plays. 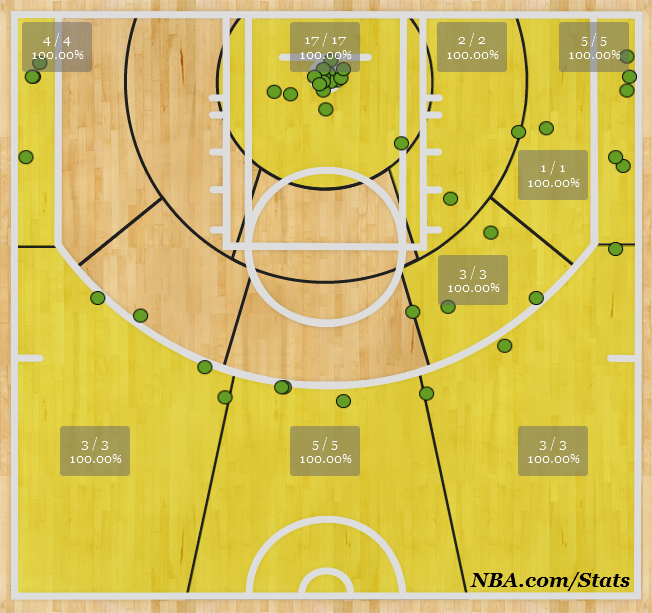 90 percent of George’s corner threes this season have been assisted, a standard mark for that area of the floor. Lance Stephenson has been his main feeder, responsible for nine out of 29 assisted threes, according to NBA.com. That’s no surprise when Stephenson’s become capable (and sometimes obviously confident) of running the offense and finding shots for not only himself but everyone else. 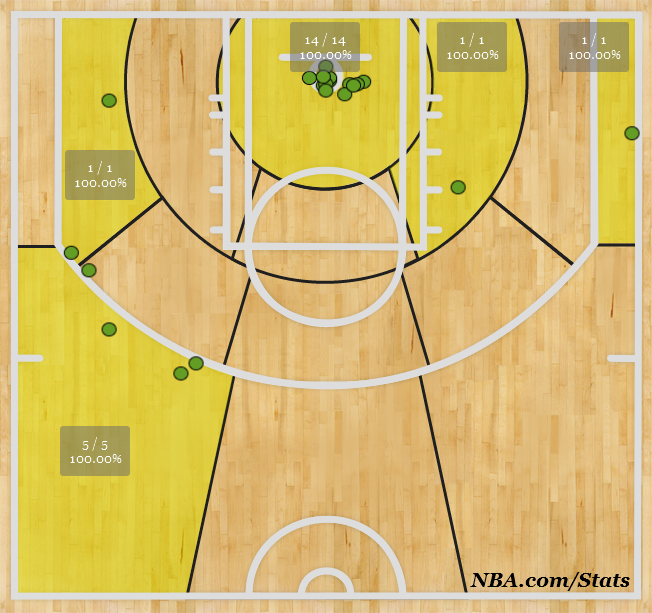 George Hill has been another primary passer to Paul George, responsible for seven assisted corner threes. I expected Roy Hibbert to have a similar impact, which he has been but primarily when George is either going to the hoop or on the left side of the arc. The difference in where each player assists to another is interesting in itself. * – projected if George played 82 games. 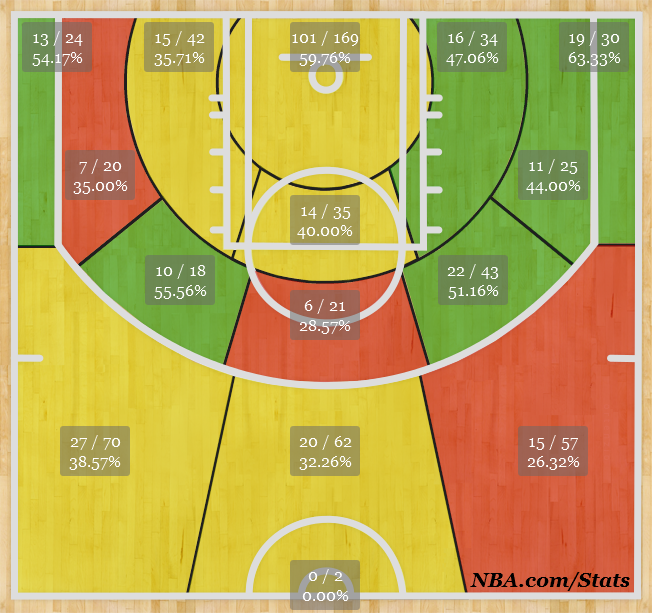 In the second half of this season, variance will probably rear its ugly head towards Paul George’s corner threes. It would take him out of the hunt for the rare accomplishment previously listed, but it’s nowhere near the end of the world if that really happens. 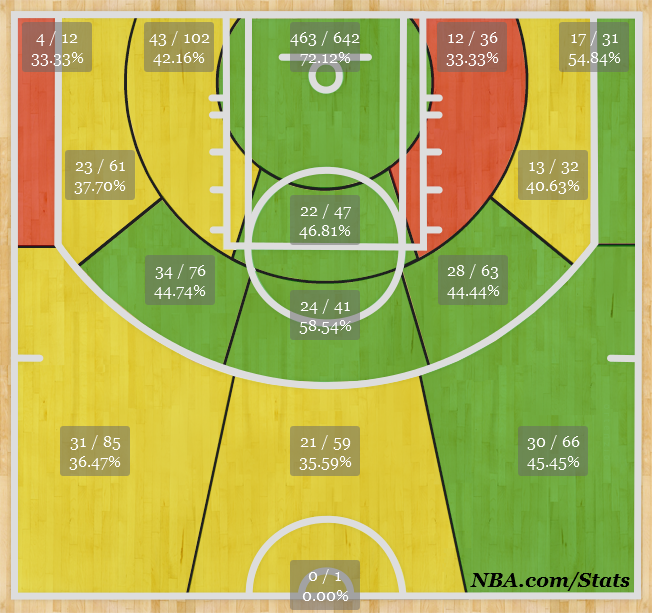 The corner three is a nice weapon for George just like it was last season, but it’s the other improvements like tightening his handles and adding a mid-range game that’s placed him among the league’s elite.